One Volume containing both English 47 pp & French 55 pp. This clear, concise and accessible report is based on participating galleries' last completed, audited financial year prior to September 30, 2013. It summarizes findings in gallery operating structure, changes over the past 20 years, exhibitions, publications, hours, admission fees, attendance, community engagement, arts education activities, marketing, collections, workforce, capital projects, and operating finances. The report contains useful results for public art galleries, volunteer boards, funders, policy makers and the public. It can be used as a tool for art gallery sector analysis, benchmarking and future planning. The Ontario Association of Art Galleries was founded in 1968 and incorporated in 1970. Through advocacy, professional development and network building, OAAG advances and empowers Ontario public art galleries. The Statistical Profile of Art Galleries in Ontario based on the Data Exchange is the only report that addresses the Ontario public art gallery sector as a whole. OAAG fosters a sustainable, healthy, diverse public art gallery sector to further the visual arts as a key component of the cultural life of the province. The public report does not include the raw Data Exchange database; the data is confidential to the 47 participating galleries. Many thanks go to the Government of Canada for funding contributed to this project through the Museum Assistance Program. This book captures and reflects the spirit of partnership between public art galleries in Ontario for The Group of Seven Project, both as a celebration of and inquiry into the Group of Seven’s legacy. In 2005, twenty-nine galleries collaborated to respond to and reflect on the Group of Seven – its art, personalities and legacy – and their relevancy and significance eighty-five years after the Group’s first exhibition in May 1920. The catalyst for the project was the Art Gallery of Ontario (AGO) making available for loan to galleries in Ontario works by the Group of Seven, due to the temporary closing of the AGO’s Canadian Wing for renovations in 2003. *Uhlyarik, Georgiana. “Introduction,” in The Group of Seven Project 1920 2005. (Toronto: Ontario Association of Art Galleries, 2010), 14-17. Ce livre vise à saisir et à refléter l’esprit du partenariat ayant permis de célébrer l’héritage du Groupe des sept et de mener des recherches à ce sujet. En 2005, 29 galeries d’art publiques ont souligné l’apport du Groupe des sept – son art, ses personnalités et son héritage – et se sont interrogées sur sa pertinence et sa signification 85 ans après la première exposition du Groupe, en mai 1920. La fermeture provisoire de l’aile canadienne du Musée des beaux-arts de l’Ontario pour les rénovations en 2003 a été le catalyseur en prêtant aux galeries d’art de la toute la province sa vaste collection d’oeuvres du Groupe des sept.
*Uhlyarik, Georgiana. 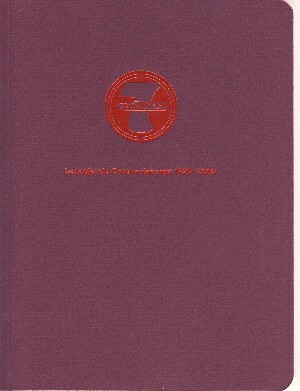 « Introduction, » dans Le projet du groupe des sept 1920 2005. (Toronto : Association ontarienne des galleries d’art, 2010), 14-17. 140 pp. 9 x 8 in. Volume 3 of the Art Gallery Handbook provides guidance and key information for curators, managers, artists, volunteers, and others dealing with programming, management, and administrative challenges related to working in public art galleries, artist-run centres, and museums. It is also a useful course textbook, and presents an excellent base of information for post-secondary students of all levels to comprehensively learn about the successful management of art and heritage institutions. Volume 2 of the Art Gallery Handbook features well-researched essays by leading Canadian professionals and takes a practical, step-by-step look into museum and gallery operations. It is divided into sections entitled The Gallery, Art Collections and Their Management, Curatorial Development and Collaboration, Public Programming, and Marketing, Fundraising and Promotion. No ISBN for French version. Two reports, one volume. English 76 pp & French 84 pp. A Statistical Profile is a quantitative analysis of 39 Ontario public art galleries in 29 municipalities across the province. 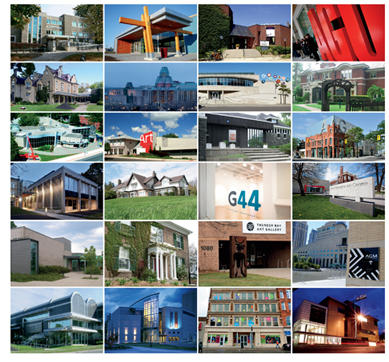 The galleries serve communities ranging in size from Bancroft (population 4,089) to Toronto (population 2,481,494). The report summarizes findings in gallery operating structure, director's successes and challenges, artistic program, public service, community reach, marketing, collections, arts education and arts learning, workforce, capital funding, operating finances, and changes in operating finances between 1993 and 2003 for the 21 galleries that have participated in both OAAG Data Exchanges. The report does not include the raw database; the data is confidential to the 39 participating galleries. Phase One was funded with contributions from the Museums Assistance Program, Canadian Heritage, Government of Canada, and Cultural Careers Council Ontario. Translation was contributed by the Ontario Arts Council. In Their Own Words summarizes the results of interviews conducted with directors, curators and board representatives of 15 public art galleries across Ontario in the spring of 2005. The interviews, designed as gallery self-assessments, were intended to collect information about the role of the public art gallery, the roles of the interview participants in the gallery, and the gallery's connection to its community. A broad spectrum of galleries participated in the interviews, ranging from the Latcham Gallery in Stouffville to the Art Gallery of Ontario in Toronto. Each contributing gallery is a member of the Ontario Association of Art Galleries and participated in the 2003 OAAG Data Exchange. Phase Two was funded and translated by the Ontario Arts Council. 147 pp. 8.5 x 6.5 in. This multifaceted examination of censorship in the arts includes a historical overview of censorship acts, recent Canadian experience within the visual arts, literature, film and theatre, a look at censorship in the hands of the law (curatorial, political and funding level censorship), and a comprehensive review and chronology of federal and provincial laws on censorship which have occurred over the years. Lawyer and art specialist Ella Agnew examines property ownership and collecting institutions, copyright and exhibiting institutions, gifts, appraisals and gifts, gifts and income tax receipts, cultural property and institutions, and loans and the exhibiting institution.